Of course, there is always the “nuclear option” of bankruptcy. 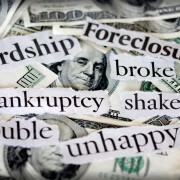 The law changed October 1, 2005 making petitioning (filing) for bankruptcy more complex and difficult. For example, not only do you have to show only a minimal amount of excess income each month over your expenses, your income may not be above a certain amount under certain circumstances. Now, attorneys may be liable for mis-statements made by the client if the attorney did not have good-faith in investigating. So, attorneys may request documentary proof of everything you say, such as the amount of your bills, expenses, income, copies of title papers, etc. Additionally, the Bankruptcy Court really wants you to be sure that you have to petition. So, now, you have to take a class before and after petitioning for bankruptcy and an attorney is required to go over with you other options, such as paying creditors back through Chapter 13 or making smaller payments. You might ask yourself about the usury laws, which talks about the most that you can be charged. “Parity” roughly means that Kentucky has to recognize any high interest rate from another state if that state allows for that interstate loan. This is why the credit card companies tend to use states that allow high interest and why your credit card is issued from that state. However, whether the interest is properly disclosed to you, properly changed with notice to you and properly calculated is another issue. For example, if you had a cash advance, was the interest started when you got the money, when the 0% APR teaser program was over? These are points to consider. So, you bought a car and did not pay. You called up the creditor and said “come get it” or maybe you left the grocery and your car was gone because you failed to make the payments. Eventually, you may get sued for “deficiency.” This is the difference between what you owe and for how much the car was sold. For example, you owed $10,000 when the car was repossessed. The car was sold for $4000 and there were about $1200 in additional charges for repossession, inspection, clerk title fees, etc. At that point, you may be sued for $7200 ($10,000 + $1200 – $4000). This is called a deficiency lawsuit. This tells you that you can buy the car back. 2. What kind of shape was the car in when sold? A lot of clients keep their cars like their children and when they discover that their “baby” was dented, dinged, chipped, or made funny noises, they have pictures of their beautiful cars to show that it got damaged after it was repossessed. If that is the case, then maybe you don’t owe the entire deficiency. Sometimes, where you bought the car was less than honest or forthright when they dealt with you (Gadzooks). Maybe they overcharged you on the taxes, maybe they sold you a warranty that you did not know about, maybe they charged you fictional government fees that never existed, maybe they sold you items that have no value like “membership” in the car dealer’s “fan club” (yes, they exist). While these are not the fault of the creditor who loaned you the money to buy the car, if you can show that the creditor should have known, then that throws off all of the calculations on the Truth-in-Lending disclosures (the big boxes on the top of the car contract) and that could be a viable defense. While the creditor will say that they did not cheat you, they may be profiting by the extra charges. So, that could be helpful to your defense.